This chapter aims to present an animated pedagogical agent, called Pat, that has the role of providing emotional support to the student: motivating and encouraging him/her, making him/her believe in his/her self-ability, and promoting a positive mood in him/her, which fosters learning. This careful support of the agent, its affective tactics, is expressed through emotional behavior and encouragement messages of the life-like character. In order to respond appropriately to the student, the agent infers the student’s emotions: joy/distress, satisfaction/disappointment, anger/gratitude, and shame, from the students’ observable behavior, that is, their actions in the interface of the educational system. 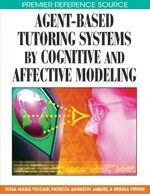 It adopted a mental states approach, more specifically, the BDI model, to implement the affective user model, the affective diagnosis, and the selection of the affective tactics, because it allows simple revisions and frequent modifications on the information concerning the student, which is convenient since emotions are very dynamic.